Over the past decade the chocolate market has undergone an astonishingly fast process of “premiumization,” in some ways comparable to the segmentation of the wine market. Viticulture concepts, such as “goût de terroir,” “grand cru” and “single estate,” are increasingly bandied around to describe fine-flavor cacao beans and denominate origin. Some bar makers have gone so far as to recommend pairing their products with specific foods or spirits. For the initial run of Terroir, Onyx has selected three distinct origins, two that will be familiar to the coffee world and one that is better known for its cacao. Their Guatemalan chocolate combines a 69% cacao grown amongst lemons, coffee, and honeybees with wash-processed Caturra and Bourbon varieties from the famed Finca La Esperanza in Huehuetenango. These concepts may well be justified given cacao’s chemical complexity. Like wine, chocolate has a dazzlingly high number of chemical compounds that determine aroma and flavor (cocoa contains more than 600 flavor compounds; red wine has some 200). Compared with other industrial crops, cacao trees represent a vast genetic variability among cultivars by region. Trees’ genes interplay with the conditions in which they are grown to produce flavor: elevation, shading, rainfall, soil type, micronutrients and even endemic mycorrhizae, the fungi that colonize a plant’s roots. Proper fermentation and drying of the cacao and their subsequent transformation into chocolate tease out the bean’s full potential. It found that the area suitable for wine production will shrink by as much as 73% by 2050 in certain parts of the globe, with high potential for stress on rivers and other freshwater ecosystems as vineyards use water to cool grapes or irrigate to compensate for rising temperatures and declining rainfall. Wine growers are challenged by increasingly unpredictable temperature swings and more frequent dry spells. This has prompted growers to expand into new, generally cooler regions, such as Oregon. These are trends we are also contending with at Izabal Agro-Forest. Across Central America, a combination of factors has already led to the conversion of farms from coffee to cacao driven principally by climate change. Drier, warmer weather is pushing cacao cultivation up the mountain into higher elevations along Central America’s cordillera. In Nicaragua, the ideal coffee zone is between 700 and 1,700 meters (2,297-5,577 feet) above sea level, but rising temperatures and lower rainfall will shift the range to 1,000 to 1,700 meters (3,281-5,577 feet) by 2050, according to a 2012 study by the International Center for Tropical Agriculture. Temperatures have increased between 0.5 and 3 degrees Celsius (0.9-5.4 degrees Fahrenheit) in the region in the past century, and temperatures in coffee zones are expected to rise another 2.1 degrees Celsius (3.8 Fahrenheit) by 2050. Simultaneously, the spread of roya — a type of fungal rust that affects coffee trees — is accelerating under the warmer conditions. In sum, we have much to learn from our wine-growing counterparts in Napa and Sonoma Valley largely because the threats are common. Jackson Family Wines has adopted high-tech measures, such as sensor-activated wind machines. While these may not be cost-effective for most cacao growers, Izabal Agro-Forest uses principles of agro-forestry, most importantly, the interplanting of overstory trees. Interplanting not only provides shade, but also serves as shock absorption against heavy rains and wind while helping to retain humidity during dry periods. Izabal Agro-Forest utilizes native hardwoods with high resilience and commercial value, including, among others, big-leaf mahogany (Swietenia macrophylla). By producing a source of sustainable plantation mahogany, we hope eventually to relieve pressure on the species in its natural habitat, which is nearing commercial depletion. Jackson Family Wines employs birds of prey by providing dozens of owl boxes and even bringing in falconers. Although controlling the population or behavioral patterns of fruit-eating birds may, at first glance, appear anti-ecological, farmers are contending with imbalances triggered by the human-induced decline of raptors and other predators. The explosion of prey populations that also happen to feed on crops can have deleterious effects on food production and even the geological landscape. I recently became familiar with the concept of “trophic cascade,” which refers to a process in which a predator suppresses the population and/or distribution of prey. The reintroduction of wolves into the Yellowstone National Park has been perhaps the most salient recent example. Researchers discovered that the flourishing wolf population altered the behavior of deer, which had become emboldened in their grazing. More than killing large numbers, the wolves drove the deer away from low-lying river areas. The retreat of the deer led to the regeneration of vegetation, which in turn reduced erosion. The return of trees and natural grasses altered the course of streams, creating habitat for beavers and other wildlife whose populations began to rebound. Perhaps Izabal Agro-Forest can draw lessons from the experience of Jackson Family Wines as its cacao stands have faced losses due to an abundance of woodpeckers. The reintroduction of raptors could be an elegant solution, although any such measures would need to occur in close collaboration with ecologists. Like many winemakers, Izabal Agro-Forest has turned to red wigglers for help. With assistance from Byo-Earth and other partners, we constructed a worm compost facility whose vermicompost has helped improve nutrient content and bio-availability to levels superior to those of inorganic fertilizers. Just as important as its nutritional content, vermicompost is a soil conditioner that improves water retention, a crucial benefit given that cacao cultivation worldwide is almost entirely rainfed and subject to increasingly dry weather conditions. Our company has deployed the ancient technique of biochar which utilizes biomass converted to activated charcoal through pyrolysis. Biochar is effective at improving the fertility of acidic soils. (The majority of tropical soils tend to be acidic due to weathering and leaching, particularly after forests are cleared). There is increasing evidence that biochar promotes carbon sequestration. Although wine grapes and cacao come from vastly different regions, they face similar threats. Growers of both are well-advised to swap notes on management techniques that enhance crop resilience and check the burgeoning threats posed by a changing climate. For die-hard chocoholics and wine connoisseurs alike, the question itself may be existential: Is a planet without wine and chocolate a planet worth living on? The Ivory Coast has featured prominently in this year’s commodity news with reports of cocoa shipments falling far below levels of previous years. This week, Reuters reported that cocoa port arrivals dropped a dramatic 16% year-on-year since the start of the season last October. A series of recent reports have linked unseasonably dry weather to the sharp decline in grindings and exports. In particular, the Harmattan winds that blow from the Sahara southward across much of West Africa have been unforgiving to this season’s harvest. Industry expectations are for the trend to continue into the next growing season mainly due to low rainfall. Not only have volumes been affected, but quality as well with smaller average bean size and high acidity being reported. As a consequence, exporters have turned away as much as half of arriving volumes. The socioeconomic impact of this damage on the country’s smallholder producers has been extensive. The Ivorian case is emblematic of supply-side challenges being faced worldwide by the cocoa industry. As the world’s largest producer, what happens in the Ivory Coast will have repercussions felt by chocolate consumers everywhere. This article reviews some of the proximate causes as well as the fundamental driver behind the crisis. In June, a group of researchers at the International Center for Tropical Agriculture published an article examining the impact of climate change in West Africa’s cocoa belt and the results are cause for dismay. The authors predict both increased precipitation and temperature extremes during the dry season. 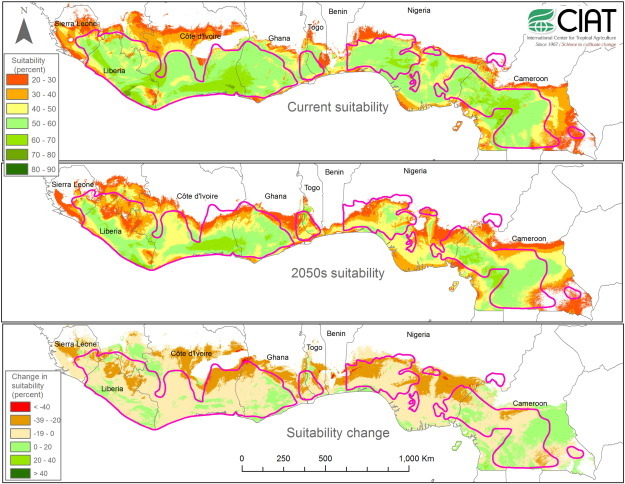 They identify the forest-savanna transition zone to be the most vulnerable, predicting 87% and 57% drops in suitable growing areas in Nigeria and Ivory Coast, respectively, by 2050. Although it is difficult to draw a causal link to climate change, farmers in the Ivory Coast recently reported a mass caterpillar invasion that has affected around 17,000 hectares of growing areas. (Link: video). The extent of the damage and the potential spread of the caterpillar have yet to be fully understood. 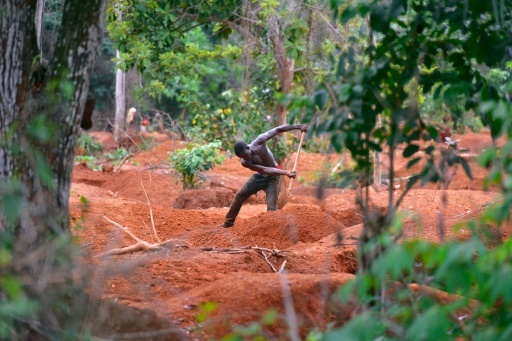 Another effect of shifting weather has been the conversion of cocoa acreage to informal mining operations as pits are torn directly into cocoa fields to extract gold. In other cases, cocoa farmers are being drawn from parched farms to the mining regions, leaving trees abandoned. Against this backdrop, ethnic tensions are simmering as thousands of Ivorian refugees return to their homes only to find the farms occupied by newcomers, often from other regions, in the wake of the country’s 2010 civil war. Many settlers include migrants from neighboring countries that have also been subject to a changing climate. The government’s efforts to adjudicate disputes through the issuance of land title have been woefully inadequate; overall, land tenure remains precarious. In such legal limbo, farmers are understandably reluctant to make needed investments in their orchards. Displacement and the resulting resource conflicts have manifested themselves in widespread squatting across the country’s remaining protected forests. Experts estimate that the Ivory Coast has lost 80% of its forested area since 1960. Forest clearance continues largely unabated and cocoa farming is pervasive on such plots. Experts believe as much as one third of the country’s cocoa may originate from protected areas. This has pitted human livelihoods against the survival of endangered species, including the pygmy hippopotamus and chimpanzees, endemic to these forests. Taking a more muscular approach, authorities forcibly evicted thousands cocoa farmers from these lands. The removal of over 50,000 people from Mont Peko National Park alone may take 10,000 tons of cocoa off the market in short order and is likely to further inflame tensions. Human rights groups have raised the alarm that the evictions have been linked to the illegal destruction of homes, intimidation, extortion and even murder. Taken together, these factors paint a picture of long-term secular decline that will not be easily resolved by a year or two of plentiful rainfall. Even more concerning is that these trends are not unique to the Ivory Coast. Recent weather patterns attributed to El Niño have adversely affected production from Brazil to Indonesia. While laudable, private and public sectors efforts to combat the effects of climate change would seem to fall short given the magnitude of the problem. One of the recommendations posed by the CIAT researchers is the adoption of agroforestry systems: “…in view of the relatively high rainfalls and short dry season in this area, the conditions for managing the projected increase in maximum temperatures through the systematic use of shade are particularly good. Cocoa could be grown here in multi-strata agroforests under a canopy of useful trees creating their own microclimate…” (Source: CIAT) Such systems are effective in buffering temperature extremes, modulating humidity, and reducing erosion caused by heavy rainfall. They are also intensive in their capture of carbon dioxide. While cocoa may be the proverbial canary in the mine, agroforestry systems, including those that produce cocoa, will undoubtedly play a role in any serious response to a changing climate. The lack of genetic diversity makes African cocoa inherently more vulnerable to pests and disease that can be spawned by changes in humidity and temperature vis-a-vis Latin America cocoa farms whose natural genetic pool is more diverse. This point certainly underscores the importance of avoiding monoculture around a handful of clonal selections; embracing endemic varieties; and employing agroforestry systems to enhance the species’ natural resilience. Now homeless, thousands of former squatters have been driven into neighboring villages that lack the resources to accommodate them. Heading into the peak Halloween and Christmas demand period, it seems likely that the scarcity will be felt by consumers and producers alike.